§ Final nominations for this year's Bram Stoker Awards for superior achievement in horror have been announced. Winners will be announced at the Bram Stoker Awards Ceremony on Saturday, June 8th at The New York Helmsley Hotel.  Judges for this year's World Fantasy Awards are as follows. Convention members nominate two entries in each category of the final ballot; to these, the judges may add three or more nominees. The judges then select the winners. Material to be considered for the award should be sent directly to each judge, with any packages marked as World Fantasy Awards Materials. Please please please DO NOT USE UPS unless you are willing to pay -ALL- applicable customs charges. § Ray Bradbury receives a star on the Hollywood Walk of Fame on Monday, April 1, at 11:30 a.m. The ceremony includes Charlton Heston and Mayor James Hahn, who earlier this month announced that Bradbury's Fahrenheit 451 would be subject of a city-wide reading program in Los Angeles during the month of April. The Walk of Fame ceremony is open to all; location is 6644 Hollywood Blvd. (between Las Palmas and Cherokee). § The New York Times has published an obituary for R.A. Lafferty.  Jasper Fforde's The Eyre Affair has won the William L. Crawford IAFA Fantasy Award, given to the best first fantasy novel published over the previous 18 months. The award was announced at last week's International Conference on the Fantastic in the Arts in Fort Lauderdale, Florida. Other awards presented included the Distinguished Scholarship award to the conference's guest scholar Roderick McGillis, the Isaac Asimov Award for Undergraduate Excellence in Science Fiction and Fantasy Writing to Lena DeTar, and the Robert A. Collins Service Award to both Bill Senior and Chip Sullivan. § Winners of the 2001 Sapphire Awards, given to science fiction romances, are Linnea Sinclair's Finders Keepers (NBI) and Susan Krinard's "Kinsman" (Out of This World, Jove). § Kelly Link's collection Stranger Things Happen (Small Beer Press) and Jonathan Lethem's novelette-length book This Shape We're In (McSweeney's Books) have been nominated for the Firecracker Alternative Book Awards, which are open to all voters. Deadline is April 20. § Finalists for the Seventh Annual Audie Awards, given to honor excellence in audio publishing, include (among 23 categories!) audiobooks of Marion Zimmer Bradley's The Priestess of Avalon, Stephen King and Peter Straub's The Talisman, Philip Pullman's The Amber Spyglass (read by the author and a full cast), C.S. Lewis's The Magician's Nephew, Clive Barker's Coldheart Canyon, Lemony Snicket's The Bad Beginning, Neil Gaiman's American Gods, and Terry Pratchett's Thief of Time (by readers including Harlan Ellison). § Finalists for this year's Saturn Awards, for SF, fantasy, and horror Film and TV, come in no less than 25 categories, plus several special and memorial awards. § Following a movement established in other cities, Los Angeles Mayor James K. Hahn launched a citywide reading initiative for the month of April, urging all residents to read Ray Bradbury's Fahrenheit 451 and participate in neighborhood book groups during the month. 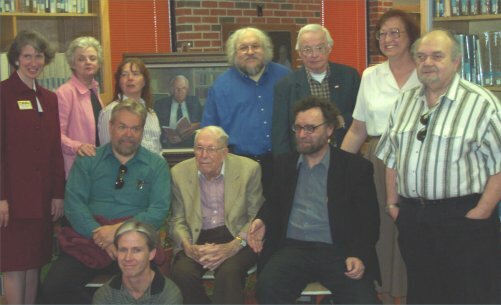 § Isaac Asimov died of AIDS, according to Janet Jeppson's forthcoming condensation, It's Been a Good Life (Prometheus Books), of Asimov's own three-volume autobiography, as reported in the New York Post and elsewhere. He acquired the disease through a blood transfusion during a 1983 bypass surgery, and died in 1992. 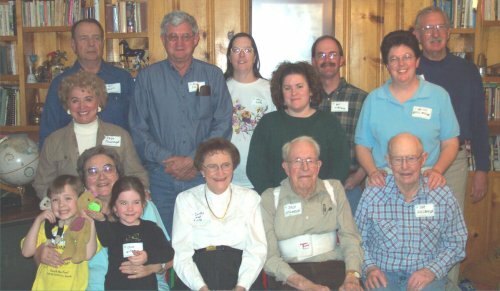 The 26th Annual Williamson Lectureship was held in Portales, New Mexico on March 7, 2002. This year's theme was "Dragons, Dinosaurs, and Darwin," a recognition of our fascination with evolution and the role fantasy and science fiction have played in interpreting its impact on our lives. Joining Dr. Jack Williamson as featured authors this year were Michael Swanwick and George R. R. Martin, with Christopher Stasheff acting as panel moderator. In addition, a number of Jack's friends from the science fiction community attended (and behaved very well), as did several "long lost" members of the Williamson clan. Following the Lectureship luncheon and panel discussion on Thursday, most of the visitors enjoyed lunch at the Williamson family ranch on Friday, before heading home. § Karen Joy Fowler's novel Sister Noon is a finalist for the 2002 PEN/Faulkner Award for Fiction, which carries a $15,000 prize, the largest for fiction in the US. Other nominees include Jonathan Franzen and Ann Patchett. 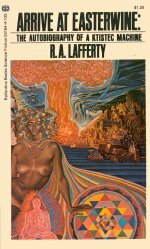 § Mati Klarwein, surrealist painter best known for designing psychedelic album covers for rock musicians including Carlos Santana and Earth, Wind, and Fire, and who also contributed cover art to Ballantine SF paperbacks in the 1970s, has died at age 70.  Drew Christian Staffanson, the partner for six years of SF writer M. Shayne Bell, died on 25 February 2002 of complications related to AIDS. Drew was born on October 8, 1962, the seventh of nine children. He lettered in swimming. He studied journalism and Arabic at the University of Utah and at the American University in Cairo, Egypt. Drew served a Mormon mission in Portugal, then worked as a foreign correspondent based in Saudi Arabia. He covered the Gulf War, and was among the first journalists in Kuwait after liberation from Iraq. He covered the Madrid Peace Talks and the Kashmiri conflict on both the Indian and Pakistani sides. He returned to Utah in 1992 after being diagnosed with HIV, which he fought bravely. He developed an interest in science fiction after meeting Shayne, and he quickly made many friends in the field. He traveled with Shayne to Armadillocon and three world science fiction conventions. He lectured at the Utah conventions, Life the Universe and Everything (at Brigham Young University, in Provo) and Conduit (in Salt Lake City), about his experiences as a journalist covering war. Drew was 39 years old when he died. He was buried near his family home in Ogden, Utah.